On February 13, CTUHR was asked to join a fact-finding mission in Compostela, Compostela Valley (Mindanao) organized by Nonoy Librado Development Foundation, Inc (NLDFI), Kilusang Mayo Uno concerning reports of military asking local trade unionists to surrender as New Peoples Army (NPA) rebel supporters and government crackdown on labour organizations in Compostela, Valley On February 15-19, CTUHR visited Davao city and Compostela Valley and together with local volunteers in the area talked and visited the workers and trade unionists in the area to ascertain the report. CTUHR is deeply concerned that the military operations which began intensively on January 22, 2018, under the pretext of Martial Law are now directed at workers and trade unionists in the vast foreign- owned banana plantations in Compostela Valley, Southern Mindanao. The military has tagged the unionists and their family members as New Peoples Army (NPA) rebel supporters and asks them to surrender at the military camp of 66th Infantry Battallion- Philippine Army to clear their names. Trade unionists were threatened that if they don’t surrender, the military will file charges against them or run the risk of getting killed. Members of local trade unions from Sumitomo Fruits or SUMIFRU, Shin Sun Tropical Fruits and Freshmax banana plantations are all affiliated with the progressive Kilusang Mayo Uno (KMU-May First Movement). President Duterte labelled KMU as one of the communist fronts, and tagged the communists as terrorists and now are targets of the government’s anti-terrorism and countger insurgency campaign. CTUHR thus appeal for your support and solidarity in calling for an immediate end to these military operations that bring the lives and limbs of workers and their families to constant danger and cause them fear and mental anguish. These constant threat against trade unionists not only violates their right to freedom of association, of collective bargaining, of assembly and of expression but also exacerbated the workers’ economic hardships as they are displaced from their jobs and livelihood. 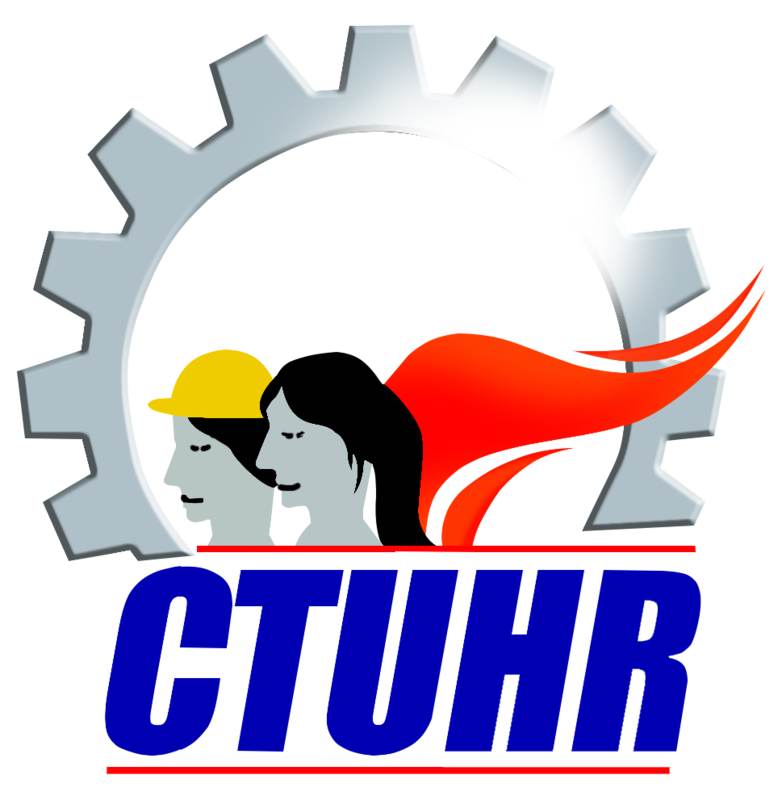 In addition, CTUHR also call for support in urging President Duterte to recant or withdraw all statements and orders maligning the trade unions and other progressive organizations lumping them together with communists, terrorists and criminals. The statements as proven to what is happening today, not only in Mindanao but in various parts of the country are being used to `justify’ the harshest persecution, from harassments to extrajudicial killings of those exercising their legitimate rights. To date, 23 workers and trade union organizers were extrajudicially killed in various campaigns of the Duterte administration. Residents of Brgy San Miguel, Compostela, Compostela Valley recalled that since January 22, 2018, elements from the Bravo Company of 66th IB Philippine Army based in Compostela Valley (Mindanao) went-house to house looking for union members of KMU local union affiliates. Soldiers began conducting area (locally called purok) meetings and asks the trade unionists to present themselves to the Army detachment in the same barangay . The local unions of these plantations are all affiliated with Kilusang Mayo Uno (KMU)- a militant and progressive labour center. Residents and members of the trade unions from Sumitomo Fruits Co, Shin Sun Tropical Fruits and Freshmax banana plantations told CTUHR that elements of Bravo Company told them to call out their relatives to surrender, clear their names or get liquidated as they possess a list of NPA supporters in the area. The 66th IBPA alleged that they got the list from members of the NPA during an encounter with the state troops. However, Mr Lito Catap, a Brgy San Miguel elected village council member assailed the so-called list, when he saw his name and the name of a long-dead relative. He said that they, and his villagemates are now worried as they don’t know who else are included in the list. Interviewed workers narrated that at the house to house visits and meetings, the military underscored that they are implementing the President (PDuterte) order’s to hunt the communist rebels and supporters as well as their front organizations and KMU is one of the identified fronts of communists. `As you are a member of KMU affiliated union , you are also considered as NPA supporters. And if you gave even a grain of salt or MSG to them (NPA), then you are an NPA sympathizer or supporter. Welma Pana, 50, a union member working at SUMIFRU’s Packing Plant 250, in Marapat, Compostela Valley for example testified that on January 22, 2018, around 1.30 in the afternoon, five (5) soldiers from the Bravo Company ng 66th IB of Phil. Army barged into her house. One of the soldiers she was able to identify, a certain Pfc Paulino asked her to go to their camp in San Miguel to surrender because they (the workers) have union. Another soldier, whom she was not able to identify asked her why she joined the union and Pana replied that they want to protect themselves and their job. The military told her that she has to come to the camp on January 23 scheduled meeting to surrender. Then the soldier left the house. Pana did not report to the camp the following day. She knows that she did nothing wrong and nothing to be fearful about being in the workers’ union. She and her family however, is worried about their safety. Similarly, Melfer Amolian, 32 years old, Union Member, Shin Sun Workers Union (SSWU-NAFLU-KMU) narrated that on January 28, about 6:00 in the morning, his brother in law on order of the village chief Harry Cabiling, reported to the Bravo company of the 66th IB PA in San Miguel, Compostela, Compostela Valley to surrender and clear his name. He then followed to the detachment 30 minutes later, and a soldier on civilian clothes who did not say his name asked him why did he join the union and what is the money that they are collecting for, if they are for the NPA? Marvin responded that the money is for the union and for the ongoing union strike. He also saw the list of names that the soldiers want them to surrender. The soldier pressed him about the activities he joined which he admitted to having participated in the march and workers’ camp-out in Manila last year, and then asked for the whereabouts of Arman Blasé. Blasé is a full-time NAFLU union organizer, Amolian said, he does not know where Blasé is. The soldiers coaxed him that it is really better to surrender, to clear his name and asked him to sign a logbook. He was not sure of what kind of logbook was that but sure that he is listed as rebel surrenderee. The same situation also happened to other union members from Freshmax, a sister company of Shin Sun Tropical Fruits. It can be recalled that on June 2, 2017, more than a week after Martial Law was declared in Mindanao, the military violently dispersed the striking Shin Sun Tropical Fruits workers protesting illegal dismissal, underpayment, violations of other labor standards and contractualization. At the dispersal the military was caught saying that `this is Martial Law and we don’t honor the Labor Code in local language’ when workers asserted that the military has no right to intervene in the labour dispute. At the dispersal, eight (8) men and women workers including a child were arrested. A Korean owner of Shin Sun Tropical Fruits ran away to escape from her legal obligations to the workers. The case is still pending at the Department of Labor and Employment (DOLE). There are other workers who have given their testimonies and complained that they are all worrying about their safety and security. Out of fear, they present themselves to the military camp, but they worry further that they are now listed as rebel surenderees. In other parts of Mindanao, repression of people’s rights is also raging. On September 28, 2017, Reneboy Magayano, 50, an agricultural worker and chairperson of Maragusan Workers Association was extrajudicially killed by suspected agents of 66th Infantry Battalion Philippine Army (IBPA) on his way to Maragusan Public Market in Compostela Valley to buy fish. On November 29, 2017, Lando Moreno, an oil palm worker in Filipinas Palm Plantation in Agusan del Sur, was also killed by combined company suspected goons and guards, and the police who was nearby the area was not able to apprehend the assailant. The FFM team visited the military camp, accompanied by the Brgy Capt (village chair) Harry Cabiling to hold a dialogue but they were not entertained. Cabiling was summoned inside the camp. The village chair was left inside the camp until the Team left the camp an hour later. The residents noted that the village chair was also sending his council members to summon residents to voluntarily present themselves to the military at the camp. Relocation of the detachment of 66th IB-PA of AFP away from the civilian populace. The Philippine Government to adhere and uphold the ILO Convention 87 (Freedom of Association and Protection of the Right to Organize and ILO Convention 98 (Right to Organise and Collective Bargaining) to adhere and respect the Universal Declaration of Human Rights and all major Human Rights instruments to which the Philippines is a signatory.